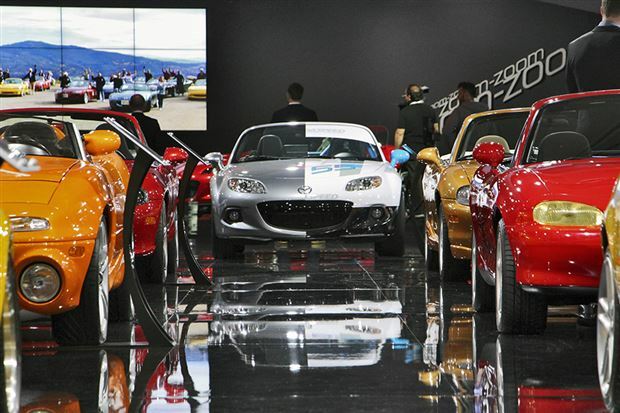 Mazda’s display at this year’s New York International Auto Show was candyland for any fan of the Miata. Truth be told, it’d have been better if they’d got things together in time for the Chicago Auto Show where the car first debuted twenty-five years ago. Still, it was great to see a veritable treasure-trove of Miatas out and about. While it was neat to see early cars and concepts like the Miata Coupe, each one of these cars had its own unique backstory. Seeing as I happened to get a peek behind the curtain when I drove the Mazda2 down to Mazda’s headquarters in Irvine, California, here’s a more in-depth look at each one of the display Mazdas, and why each is important. It’s hard to imagine an accounting department grumbling about building an eventual Guinness world record holder for sales volume, but that’s pretty much what happened. It’s not that the Miata nearly didn’t make it, it’s more that it was very nearly a front-wheel-drive convertible based on the newly-introduced Familia (323) platform. Certainly, such a car would have made far more sense from a development standpoint. However, these two cars are what happened instead, once the sheets came off the original clay model. While the Japanese design studios fielded concepts that resembled the Toyota MR2 or a Golf Cabriolet, it was the California studio that would win the in-house competition, and create the foundation for the world’s bestselling roadster. These two represent the Miata in its purest form, as first seen by a North American audience; they both sat on stage at the debut in Chicago in 1989. Painted in Mariner Blue and Classic Red, they are, respectively, the fourteenth and fifteenth Miatas ever built. Both still run, and are stored in Irvine alongside retired racecars and former SEMA flights of fancy. There was a funny moment at the show when Bob Hall and Tom Matano jumped in the Mariner Blue car for a photo shoot, and one of the Mazda booth attendants came over to tell them to get the heck out. Both men are recognized as two of the fathers of the original Miata, Hall for coming up with the concept and involvement in its creation, and Matano for penning the design and hand-shaping the clay. Less pampered, and probably happier for it, is this former Chicago debut car. Immediately after the show, it was rolled off stage and straight onto the racecourse. It was converted to showroom stock format for SCCA racing, and spent many years scrapping it out on track with MR2s and the like. This Miata, which at first campaigned with a mismatched red hardtop, blazed the trail for a legion of scrappy little roadsters. What they lacked in outright speed, they made up for in handling and nimbleness, and they were easy to work on. The little roadster that could would get its own Spec series, and even today Miatas can be seen on any racetrack from Laguna Seca to the Nürburgring. This one was the first, but today Mazda estimates something like 5000 Miata-based racecars are in regular use.